Rising costs of living have turned the majority of Australian grocery shoppers into bargain hunters, says Datamonitor, with new data revealing how shoppers hunt for supermarket savings. The research firm says that Australian shoppers have evolved into bargain hunters with a keen eye for savings at the supermarket, driven by economic uncertainty and rising costs of living. According to new research by Datamonitor, 62% of Australian consumers consider it important to find bargains when grocery shopping. 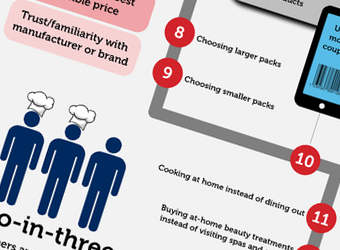 To highlight the various strategies that shoppers employ to save money on groceries, Datamonitor created the below infographic, which offers a snapshot of some of its research findings and reveals 20 ways that shoppers save money. As the drive to economise becomes a major part of the Australian grocery scene, Datamonitor found that Australians are placing considerably more trust in private labels. With 47% of Australian shoppers actively buying more private labels to save money, lower-priced store brands are clearly growing their share of basket among value-conscious consumers. However, marketers need to explore other ways to appeal to consumers’ sense of value besides simply dropping prices. Personal care products, for example, deliver superior value by offering multi-functional benefits that not only save money, but also time and storage space. Food or drinks manufacturers are also leveraging this by offering customisation or emphasising versatility to serve multiple needs at once. Katrina Diamonon, senior analyst at Datamonitor notes that value-for-money positioning must be implemented carefully so as not to imply compromise: “Particularly in the premium market, value-focused brands need to balance the emotional desire to treat oneself with the rational appeal of saving money. Positioning products as ‘affordable luxuries’ or ‘earned indulgences’ are effective and credible ways to convey superior value-for-money,” she says.